Why Are Your Pickleball Courts Receiving Complaints from Neighbors? Pickleball is a game played with a paddle and ball on a converted tennis court or dedicated asphalt pad. It has become very popular in retirement resort communities and other recreation centers. Unfortunately, some developers of pickleball courts have not adequately addressed the sound produced by the impact of the hard paddle and ball which creates a sharp pop. This has led to controversy between facility owners and neighbors when new pickleball courts are planned. Here in Arizona and elsewhere we have planned and mitigated many of these sites. We have had the opportunity to work with both pickleball clubs and home owners associations. In this post we will outline the process we have developed to evaluate the noise impact of pickleball courts and to enable pickleball to coexist with the surrounding community. The sound produced by the impact between a pickleball and paddle is characterized by a sudden onset and brief duration, typically on the order of two milliseconds for the direct path sound. Figure 1 shows a time trace of a pickleball paddle impact measured near Phoenix, Arizona. 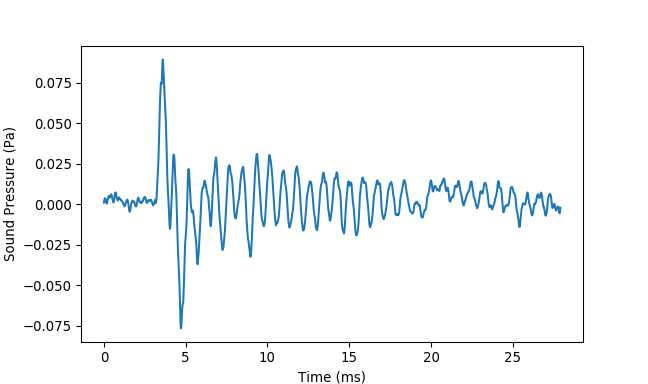 The main part of the direct sound impulse can be seen to be less than two milliseconds followed a rapid decay and some later reverberant arrivals. 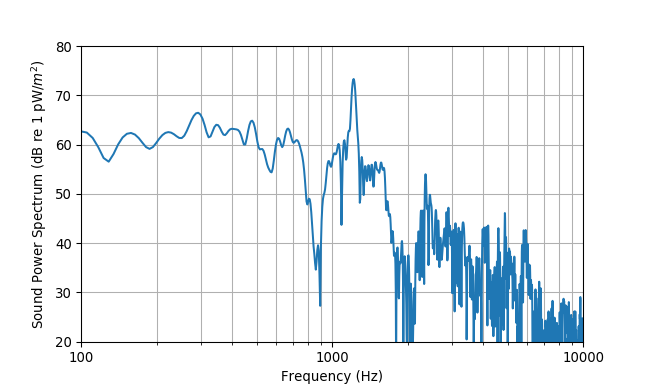 The spectral content of the paddle impact is narrowband with a center frequency typically between 1,000 and 2,000 Hertz (see Figure 2). Although it does not meet most guidelines for tonal prominence such Annex C of ANSI S12.9 Part 4 or ANSI S1.13, it does impart a vague sensation of pitch similar to a musical wood block percussion instrument. The radiation pattern of the paddle is more or less a dipole, i.e. the sound from the front and back of the paddle is of opposite polarity and cancels itself in the plane of the paddle. Therefore, orienting the courts so that the direction of play faces away from noise sensitive areas can provide some attenuation. Due to the short duration of the impact, averaging sound pressure level metrics such as equivalent level (Leq) and even maximum fast exponential time weighted level (Lmax) fail to accurately represent the perceived loudness of the impact. The fast exponential time weighting filter is a first order lowpass filter with a 125 millisecond time constant applied to the square of the acoustic pressure waveform. If a tone burst is applied to the squaring circuit and filter, after two milliseconds the filter output will only rise to a level that is 18 dB lower than the root-mean-square or equivalent level of the input signal. Because the short impulse is being significantly attenuated by the averaging in the sound level meter, in practice it is in general not possible to distinguish pickleball paddle impacts from the background noise when measuring Leq or Lmax using an integrating sound level meter even though the paddle impacts may be identified by a listener as the primary sound source. The paddle impact sound pressure level is better represented by the sound exposure level (SEL). This involves windowing the measured sound pressure in time to include only the paddle impact and reflections from nearby surfaces. The equivalent sound pressure level of the windowed impact is then normalized to the length of the window giving a representation of the energy in the impact alone. Appropriate adjustments for impulsive sounds can then be applied to the impacts as described next. Most acoustical standards for sound pressure levels with regard to compatible land use provide adjustment factors for different types of sound, e.g. impulsive, tonal, time of day, etc. Each of these categories of sound produces different levels of community impact and annoyance due to their temporal or spectral characteristics in comparison to a broadband sound that does not vary in level or frequency content with time. The purpose of the adjustment factors is to normalize these types of sound to a neutral broadband sound pressure level so that they can be reasonably compared to a defined sound pressure level limit or the background noise level. ANSI S12.9 Part 4 gives criteria for assigning adjustment factors to a variety of impulsive sounds. Sounds produced by many impact processes are classified as ‘highly impulsive’ and assigned a 12 dB adjustment. Although not specifically enumerated in definition 3.4.1 of the standard, experience has shown that pickleball paddle impacts should be adjusted as highly impulsive sounds in order to set appropriate performance goals for abatement treatments. Inadequate abatement treatment will lead to ongoing complaints, strained relations with neighbors, the need for continued involvement on the part of authorities, and additional retrofitting and possibly demolition costs to improve the abatement later. Based on our experience working with pickleball facilities, courts located within 350 feet of residential structures often require abatement. Courts located within 150 feet require careful abatement design to avoid complaints. Abatement treatments usually consist of freestanding walls strategically placed to shield noise sensitive areas from the pickleball courts. To be effective, the walls must block the line of sight to the paddles during play. On level terrain this means a minimum wall height of eight feet above the playing surface. The cost of the walls can be reduced by lowering the courts into the ground and using the excess soil to build a berm around the courts. Placing the wall on top of the berm will lower the required height of the wall itself, reducing construction costs. The wall may be masonry or a solid fence system having sufficient mass for effective sound insulation. For pickleball courts located in the middle of a residential area with houses on more than two sides, screen walls may be required on opposite sides of the courts. When these walls are parallel to each other, reflections between them can degrade the performance of the walls significantly. In this case, sound absorbing panels may need to be installed on one or both walls to stop multiple reflections from amplifying the sound going over the walls. This can almost double the cost of the walls and may make the site financially unfeasible. Court orientation also plays a role. More sound propagates in the direction of play than to the sides of the pickleball court. By positioning the courts so that the line of the net runs through the most noise sensitive area, a noticeable reduction in sound pressure level can be achieved at this location. We recommend that pickleball courts to be located within 500 to 600 feet of residential properties or other noise sensitive areas be reviewed by an acoustical engineer during the site selection phase in order to avoid choosing a site that is expensive to mitigate, results in unexpected limitations on court use, or leads to ongoing disputes with neighbors. For sites that have a water feature or golf course as part of the intervening ground between the courts and homes or for sites located in a valley, it may be necessary to consider abatement at buffer distances greater than 500 to 600 feet due to additional refraction effects created in these situations. The abatement plan for the site should be prepared by an acoustical engineer with experience in assessing the community impact of short duration impulsive sounds such as those produced by pickleball paddle impacts. As can be seen from procedure outlined above, properly measuring sound from pickleball courts is not a simple matter of setting up a sound level meter and logging an equivalent sound pressure level (Leq). The short duration impulses produced by the paddle impacts require a detailed process of applying a metric that can accurately represent the community noise impact of the pickleball courts. If you are in the process of planning pickleball for your site, consulting an acoustician can reveal unforseen issues with the selected courts site or the site plan before investing tens or hundreds of thousands of dollars in design and construction. Preparing a formal abatement plan can also ease concerns of neighbors about the community noise impact of the courts. If you would like us to help plan or mitigate your pickleball courts, contacts us today for more information. This entry was posted in Noise Control. Bookmark the permalink. 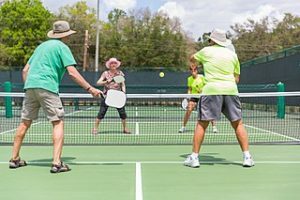 4 Responses to Why Are Your Pickleball Courts Receiving Complaints from Neighbors? I live on the property line of the Yellowstone Golf and COuntry CLub in Billings, MT. The Club proposes to place a pickleball court extremely close to my property line, within 50 feet! I have apprised them of the problem and referred them and their architect to your studies. I am also seeking legal counsel. The club manager states they were not aware of the problem. Do you have a comprehensive list of the pickleball studies you have performed nationally, or other information concerning the volume of complaints, lawsuits, etc. related to pickleball nationally? I am obviously, trying to build a case for redesign, distancing from my (and others’) property, mitigation, etc. Thank you. 50 feet is very close. Pickleball courts placed at this distance from residential properties usually result in complaints without significant mitigation. A list of some of our environmental acoustics projects is available on the website. We’ll try to put up a category for pickleball in the near future. The best way to proceed would be for the country club to contact us and discuss doing a noise abatement plan for the proposed courts site. That would enable them to address any community noise impact issues before they become a problem that is expensive to retrofit. Pickle ball courts were built within forty feet of our residence. Not only is the pickle ball noise loud, but the players scream as loud as possible while playing. Can anything be done legally. This will depend on the noise legislation for your area. Every county and municipality has a different standard for defining nuisance noise and how to measure it. In most cases, regulations for impulsive sound are not defined by these ordinances and so we rely on the ANSI standards mentioned in the post. Enforcement is usually handled through your local police or department of developmental services. If the site owners would like to mitigate the impact on neighboring properties they can contact us to discuss creating a noise abatement plan.